A very powerful medical grade strain, Super Nuken stems from a cross between a God Bud female and a Kish male. 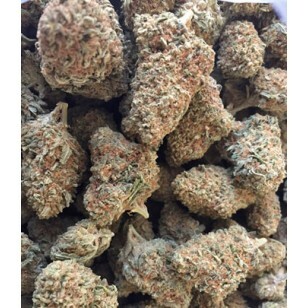 Indica dominant, it has been used to treat everything from insomnia and anxiety to headaches and acute pain. There is a definite relaxation involved here both in terms of your body and mind. As it is “super” you may not want to use this while working, driving or actively doing anything. The Super Nuken strain of medical-grade marijuana is a cross between a God Bud female and a Kish male. God Bud is, of course, one of the world's most demanded purple skunk strains; famous for its deep body stone. Kish is a double-crossed Shishkaberry, a strain that produces heavy, resinous buds and also generates an Indica-dominant body-centred buzz. If you're looking for an Indica-dominant strain to help combat chronic pain, insomnia, anxiety and/or stress, then Super Nuken should be near the top of your list. This strain tastes like marshmallows melted down with stirred-in skunk and produces room-reeking aromas. Super Nuken marijuana will make your body and mind relax deeply and peacefully. She's not recommended for work breaks, driving or anything else that demands a whole lot of mental/physical involvement. We call this phenotype "Super" Nuken to distinguish it from plain Nuken. It becomes "Super" because of the heavy feeding regimen and the strict curing process it goes through before we bag it up for you!